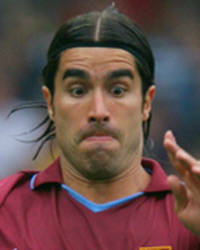 Aston Villa striker Juan Pablo Angel is the latest player to follow the David Beckham gravy train to the USA. The Colombian has signed a Â£40,000 a week deal with Red Bull New York. The crap-turned-good-turned-crap-again forward has lost his place in the Villa first team since Christmas and was behind John Carew, Luke Moore, Ashley Young and Gabriel Agbonlahor in the pecking order. Its good for the MLS, if a few players of this calibre trickle in every year the league may amount to something after all. Slowly players are starting to head over earlier and earlier, Matthaues and Stoichkov came when they were nearly 40. But if top class players in their early 30s can be attracted its certainly a positive step. Angel should fit in well in NY where there is a large, passionate latin fan base.